We offer a full service from design to production press work. Our skilled engineers have extensive experience in precision machining and production press work. We can offer valuable advice on the best way to produce components and assist in the design of components. We work closely with our customers to achieve the exact components required and are experienced in working to tight tolerances with many types of metal. Using our on-site power presses, we can undertake small, medium or large volume production work. We can either use a customer’s own press tool or we can design and manufacture a press tool for a specific job. From sourcing material, to manufacture, to packaging, we can fulfil your production press work requirements in an efficient and timely manner. 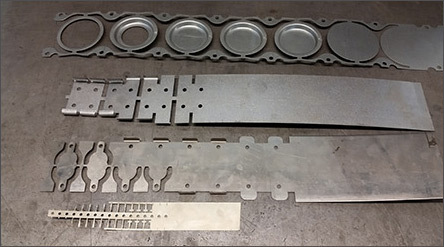 We can also produce prototype press tooling and sample components as part of an ongoing project and assist with this process at each stage. This may involve a number of prototypes being made and adjustments to tooling until the final stage of development is complete. If you have components which need to be modified, we can advise on the best course of action and carry out any work necessary. This may require an adjustment to a tool or we can manufacture a tool, jig and fixture specially for a job.